Hang Free is a free, bi-annual outdoor party that occurs in Fairmount Park in Philadelphia. Initially thrown as an Sunday afternoon alternative, the first Hang free happened in October of 1995 on a warm sunday day, thrown by Andrew Davidson of Under Design & Stacy Papa, as well as a whole host of supporters, friends, and DJ's. In 2015, long-time supporter and resident DJ Linda Leigh along with her good friend DJ D.R.E.O. took on the responsibility of running the Hang Free events. We provide DJ's spinning music in an outdoor, casual atmosphere, where there is no cost to hang and listen. Therefore, Hang Free. While this event acts occasionally as a venue for new, up and coming DJ talent, but it is also an alternative to the typical nightclub scene, offering local jocks opportunities to spin new, experimental sounds. Past guests have included: Mark Farina (San Francisco), Jojo Flores (Canada), The Upbeats (New Zealand), Schoolly D, Nigel Richards, Big Daddy Blake, DJ Dozia, Lee Jones, Rob Paine, Hollis P. Monroe, Maggy's Rooftop Aerial, and plenty more! When was the last time you were outside listening to a live DJ? This is also a perfect opportunity to see the same familiar faces you see each week at the same clubs & parties in a daylight setting. Each Hang Free guarantees some sport & fun (such as touch football or frisbee or volleyball) with friends and soon-to-be friends. Returning to our story after their first coverage 13 years ago, Philadelphia Weekly writer Brenda Hillegas penned another lovely summary of Hang Free in 2011. In 2010, our good friend (and long time attendee) Hadas Kuznits did a few radio stories for local talk radio KYW 1060 AM. They'll be playing all weekend on KYW, bringing lots of new friends out to Hang Free! You can listen to the full interview at the KYW News Podcast Page, or listen to the two short 45 second news pieces as they ran on KYW 1060 AM all Memorial Day Weekend 2010. Click the play arrow to hear the stories right in the browser. In 2009, NBC 10 News' Bryan Scott did a small news piece bumper about our Labor Day event where they got our name wrong...! We're featured in the last 15 seconds of this 2 minute video, and Stacy makes a cameo. 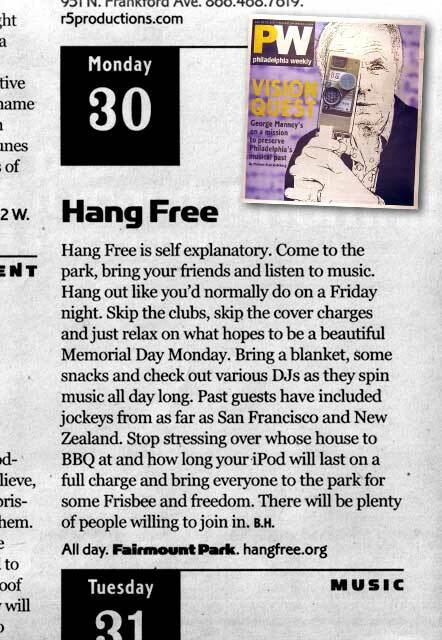 The Philadelphia Weekly wrote a little piece on the Hang Free events back in 1998, written by attendee Peter Wilson.